Typically served as a side dish, enjoy this rich Kugel with sweet potato latkes, lentil soup or fattoush, which is a Middle-Eastern chopped vegetable salad. Preheat oven to 375°F. Grease a 9 x 13 inch casserole dish. Cook the noodles in boiling water for 5-6 minutes, until just al dente. Drain and rinse noodles. 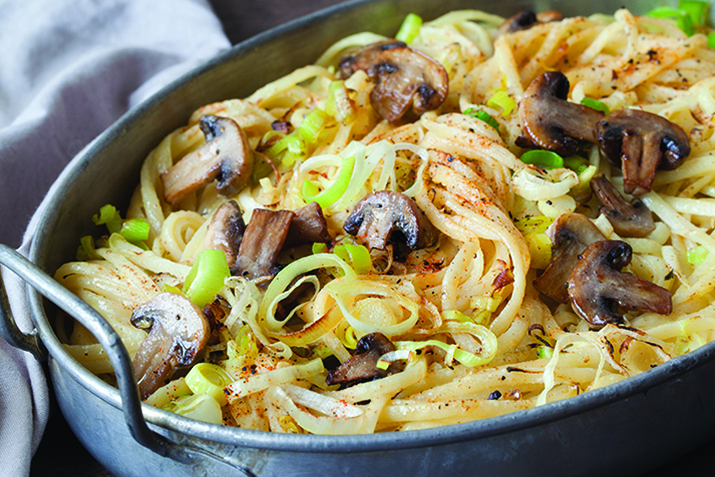 While the noodles are cooking, heat 2 tablespoons vegetable oil in a skillet over medium-high heat. Sauté the leeks for a few minutes and then add the mushrooms and sauté until tender, about 5-10 minutes. In a large bowl, mix the cooked noodles, sautéed vegetables, eggs, sour cream, salt, pepper and 1 teaspoon of paprika. Pour into the casserole dish, sprinkle with the remaining paprika, cover with foil and bake for 30 minutes. Remove the foil and bake another 10-15 minutes to brown the top. Serve hot.